In just two days Jay Hieron will lock horns with Jake Ellenberger making his return to the UFC for the first time in seven years. Hieron last fought Jonathan Goulet in October 2005 when he lost to TKO due to cut. 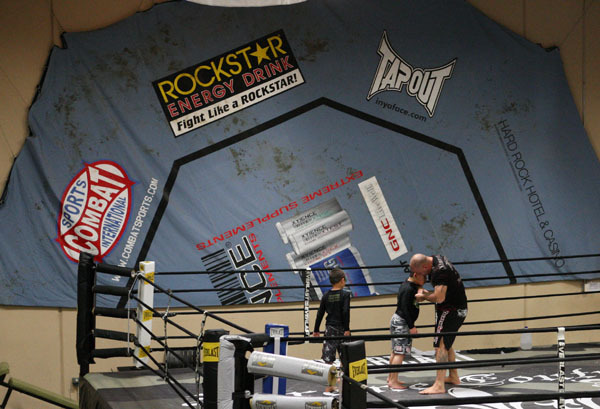 This bloodied UFC mat has been on permanent display inside Xtreme Couture MMA right when you walk in. Jay Hieron in 2006 gave Jake Ellenberger his first professional loss a broke Jake’s 12 fight unbeaten win streak. Jake Ellenberger is no stranger to Xtreme Couture MMA facility either, he has trained here with the pro team, he has learned nutrition advise from XCAP and Randy Couture, he has fought two other of our pro team members, beating Mike Pyle and losing to Martin Kampmann where Jay Hieron corned Martin. Jay Hieron has had a great team helping him prepare for perhaps his biggest fight, biggest rematch of his career and of course the pressure of performing great in his UFC return. Support Jay Hieron by getting his official Xtreme Couture walk out shirt $25. A 2008 U.S. Olympian and former ESPY award nominee for Best Collegiate Athlete, Ben Askren, the reigning Bellator Welterweight Champion, will put his title on the line for the first time against Xtreme Couture fighter Jay Hieron. Askren and Hieron have made no secret that this fight will be a grudge match of sorts as both competitors have used social media to display their dislike for one another. While both fighters certainly respect each other’s accomplishments, contrasting styles and personalities have added another level of intrigue to an already highly-anticipated fight. For Hieron, the former UFC veteran and Las Vegas-trained fighter is looking to extend his winning streak to 11 with a championship victory over Askren. “The Thoroughbred” earned his title shot by claiming the Season 4 welterweight tournament with victories over Anthony Lapsley, Brent Weedman, and former judoka Olympian Rick Hawn. While the New York native fully understands the Midwest crowd will mostly be in Askren’s corner, that doesn’t bother the confident Hieron. 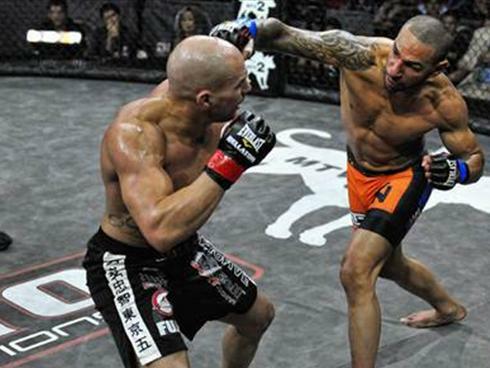 The scorecards propelled Xtreme Couture’s Jay Hieron to the top of Bellator Fighting Championships’ latest welterweight tournament on Saturday. Hieron won a split decision over Rick Hawn in the final of Bellator’s 170-pound tourney. It was the main event of Bellator 43 in Newkirk, Okla. Judges at Bellator 43 gave the nod to Jay Hieron, right, over Rick Hawn. Although Hieron and Hawn both have ample takedown skills, most of the three-round fight took place standing. Hawn had only one serious takedown attempt, but he set the pace by stalking Hieron throughout the bout. Two judges scored the bout 29-28 for Hawn. One recorded the same score for Hawn. Hieron won his 10th consecutive fight. Winning the eight-man tournament means a title shot against champion Ben Askren later this year. Hawn suffered his first loss in 12 professional fights. Xtreme Couture’s Jay “The Thoroughbred” Hieron punched his ticket to the Bellator Welterweight Tournament finals with a tough-fought decision win over a game Brent Weedman. Hieron is an extremely tough guy who doesn’t mind mixing it up with anyone. With the win, Hieron now meets Olympian Rick Hawn in next month’s tourney finale. Hieron (21-4 MMA, 2-0 BFC) now has won nine consecutive fights. Xtreme Couture’s Mike Chandler dominated his way to victory on Saturday night. The former University of Missouri wrestler’s takedown and ground skills have led him to another victory and a ticket to the lightweight tourney’s finale. Using his improved and fearless striking to set up at least four takedowns in each frame, Chandler dominated the first and third rounds to earn a unanimous-decision victory over fellow semifinalist Lloyd Woodard via scores of 29-28. With his victory, Chandler now meets KO artist Patricky “Pitbull” Freire in the tourney finale next month. Brent Weedman is a good fighter, and he took out a fighter in Dan Hornbuckle that I thought he would not be able to beat. The truth is that Dan has not been the same fighter that he was over in Japan where he was knocking out fighters and finishing fights. Brent’s only ever loss to tough fighters, but that is where his fault lies as Jay is one extremely tough fighter. 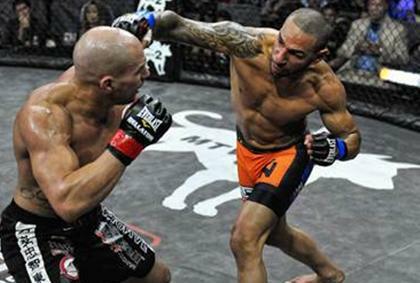 Jay Hieron an established top dog at Xtreme Couture MMA in Las Vegas has always been a fighter with the ability to be a champion, but he never had the chance. The IFL failed, Affliction went under, and Strikeforce never followed through with their promise. He has just had bad luck. He entered this tournament with one thing in mind being a champion and that is all that he is focused on. The Bottom Line: Jay Hieron is too focused to lose. The strengths for Michael in this fight re his wrestling, his hands, and his submission. Obviously, in the first round of this tournament you saw him submit a strong BJJ fighter in Marcien Held, but he also got caught in multiple submissions. If someone was able to hold onto a submission they caught him in it would stop him. He has strong hands, but so does Lloyd. Lloyd has big knockout power as seen in his first fight too. He also has a strong BJJ base since he has submitted more people than he has finished with strikes. The big remaining factor is the wrestling. We know that Michael can get Lloyd down. Look for this fight to be wild as either fighter could pull out something that would surprise everyone.